I am no follower of fashion rules (no red lips over 50, e.g.) except for my own: nothing too short, too tight, or too low-cut. YMMV. A prairie skirt may be said by some to be for the young. I say phooey to that. The classic American Prairie look has a long history, from the actual Western prairie, to square dancing, to Gunne Sax (remember them?) and Ralph Lauren’s 1978 collection. As Ralph Lauren is the modern master of the style, I’m wearing a Polo cotton prairie skirt (similar) found at a consignment store for about $7. It’s a lovely weight cotton, and I enjoy all the bias cuts and the swing. The navy knit top (similar) is not prairie at all, just an old closet favorite. It keeps me from looking costume-y with my big skirt. The boots are my current faves, the “Troopa” by Steve Madden. They go prairie, or urban, or badass (I love that term for a 60 year-old suburban retiree 😉 ). To fend off the raw Florida winter, a houndstooth scarf (sim) in a bright color. A bright bangle (sim) for contrast. I just had my remaining blonde hair lightened and toned to silver, so we are getting there! Hello there! Great series! I was thinking if you wanted to go even further back through the history of &#ei;02r8mix2ng” you could even reference the collage works of Surrealists such as Max Ernst or Andre Breton. There is actually a section in the first Surrealist manifesto in which Breton takes clips from various newspapers and assembles them into a “poem” of sorts. The process is nearly identical to the one performed by Burroughs and was published in 1924 (a truly “early” form of remixing). Just a thought. Hi Patti, I am Magda from Poland (in fact – from Bloglovin :))) . I am glad You founded me 🙂 I like blogs with fashion above 40, because I am above 40 (ok, sometimes I am tried to look like 25, why not :). Anyway, I like this colorful outfit and this is one of the best yours lately – but in this yellow scarf. It gives much. Super combination of colors and I like this boots – its unusual, badass :). Looks great, original! I see You like create. I love the skirt, and you look so radiant in this outfit! I LOVE that skirt! It’s so stunning with the fishtail hem and plaid print! So prairie chic! Pretty skirt and I love the yellow shawl with it on you. Those two colors look great together.The boots are so cute too! Great outfit, Patti! The skirt is amazing – what a find! That’s a really terrific ensemble, Patti. Such a stylist you are, especially with that winter wrap for those cool Florida winds. I have the same boots! I love your skirt and badass boots, I can just imagine you stamping and swirling about. Badass with a bit of a flounce – what better! Great style as always! Nice! Patti, love this prairie skirt, beautiful cut and color. It flows or so well on you. I actually spotted a new Ralph Lauren prairie style skirt this season and walked away shaking my head that I hadn’t held on to my 1980’s style. But closet space is closet space, right? Those boots are proving to be a must have item. And I love the added touch of yellow you threw on with the scarf in keep you warm in your cold Florida Winter, haha. The school is not doing the right thing here! They should be providing these girls with the psciaologychl help they need to rid them of their homosexual desires. Super cute look on you! I am not a fan of prairie skirts on me, but you are rockin it for sure!! 50’s style is great and I totally embrace my age like you! I just turned 51..
Patti, you know how there are some styles which, we believe with absolute conviction, simply do not suit us? Well, prairie style is my special beast 🙂 I can’t imagine me in anything remotely like what you’re wearing and looking halfway decent, let alone looking positively stunning as you do clearly do, my friend!!! And because I can’t imagine wearing prairie-esque, I am SO going to attempt it GRIN much love!!! Love it and love you make up your own rules. We all should! Oh yes, I remember Gunne Sax dresses. And they’re so hard to find now, especially in sizes that aren’t miniscule. You often see prairie skirts in tiny floral prints, but I really love the look of the diagonal windowpane check on yours. Unique and looks great with those boots! You look fabulous Patti! Your locks are luscious and I had to scroll back up to take a second look at the colour….I love how your transition away from colouring has been so natural and organic! Gorgeous! 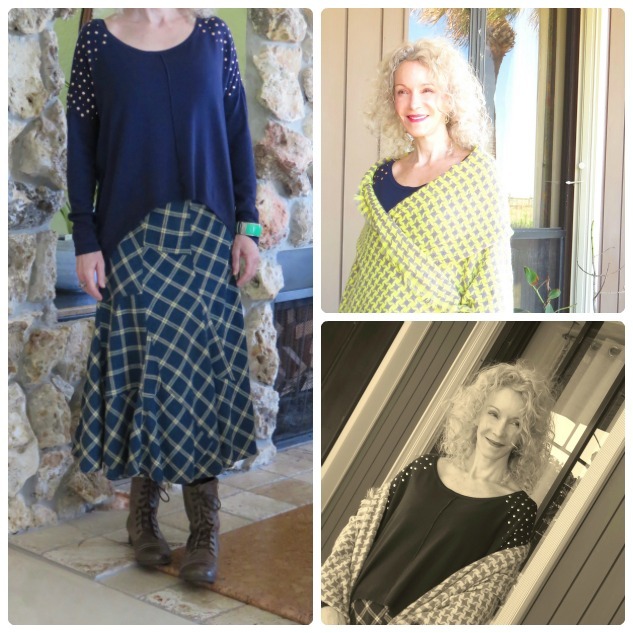 That skirt is a work of art…the piecing is boggling my seamstress brain. I really love this skirt! The pattern mixed with the cut make it so unique. Blue really is your colour. The hair is looking fabulous! but you hair always looks great. Love this outfit, Patti, and those boots are fab! This is such a lovely and fun layered look Patti – and love your fresh hair color! Have a fab week ahead! You look adorable, as always! I love the yellow addition, it looks so “Springified” and your hair is perfect. I love the color! You look super adorable in prairie-chic! I feel inspired! Thanks so much for starting our Mondays right with a fun linky! such a fun look! i adore the piecing of that skirt! A very fun look! The plaid prairie skirt and badass boot combination made me smile. 🙂 I can see why those boots are a current favorite. This is a cute look, Patti! Badass you are Patti! Who knew you could use prairie skirt and badass in the same sentence…lol! I love the skirt and it was made to pair with those boots. Well, I love a bit of badass on a Monday morning. Sets me up for the week ahead, Patti so thank you! Love the different textures and patterns here. Fun for Spring. I love, your longer hair and your style, dear Patti. Patti, I love that yellow wrap with this patterned skirt. Oh yeeeah! It’s country with a big badass twist. And the bracelet, another punch. Thanks for this party yet again. Great skirt and I love it paired with those boots to give some edge to the sweet skirt. Fantastic look Patty! Love the colours of this outfit and the skirt/boots combination works just perfectly! 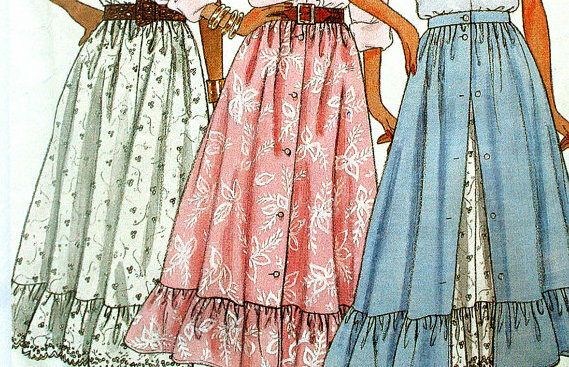 I’ve been contemplating going for a retro prairie look too but I had some of those dresses when I was a little girl so… I want to do it in a grown-up way. Maybe your post will give me the kick to try it. I just got a vintage, April Cornell dress that’s almost prairie style and very pretty. Look for it in an upcoming post. I think the graphic prints are a good balance for the prairie styling, and keep the look from going twee. Nice! A great combo with this top/skirt/boots. Love this look, Patti. Thank you for the link up, Patti! Have a wonderful week! Great look! The skirt is another fabulous find of yours! The yellow & blue are fabulous together! I have that exact same skirt! It’s wonderful – I love mine in the summer. Looking gorgeous, Patti! Thank you for hosting – I’ll be linking up tonight! Oh, prairie skirts are so wonderful for hot weather! I used to wear them, too, when I was a teenager in the early 80s. So perfect for summer! You look lovely in your signature blue. Hi Patti! The pattern on your skirt is so fun and whimsical. What a great piece! I LOVE this look!! The colors of yellow and blue are divine and the patterns look so sweet together. Such a lovely outfit Patti! !